Chewy, fudgy, sweet, and salty…this treat is EVERYTHING, plus made with just 5 whole-food ingredients. I love to whip up a batch of these each week to fill that ‘I need a something a little sweet’ craving. 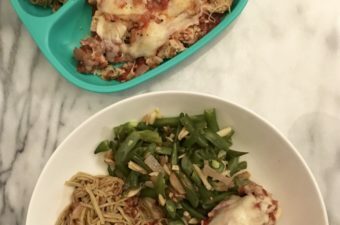 The kids love them too! 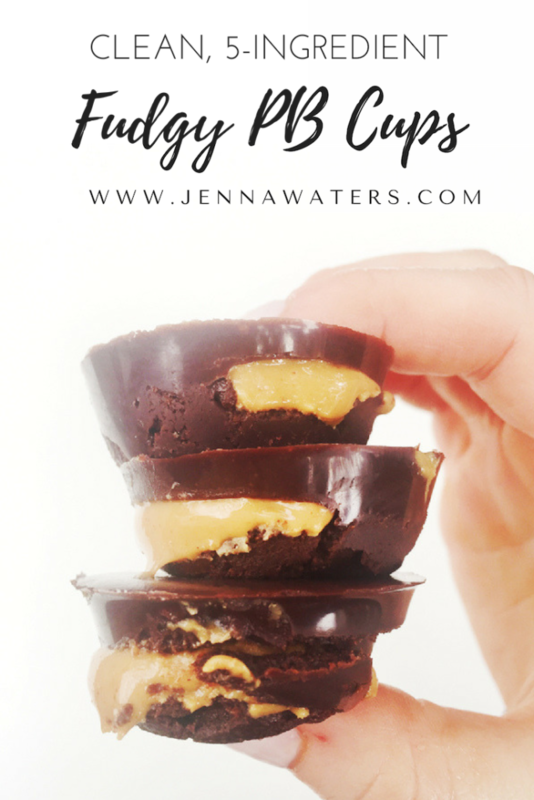 I think what makes these so good is the different texture of all the layers— the chewy almond-flour bottom, the creamy peanut butter middle, and the smooth fudge-like chocolate top. After you make the base layer, refrigerate for a bit to make for easier scooping! These are the mini silicon muffin molds I use. 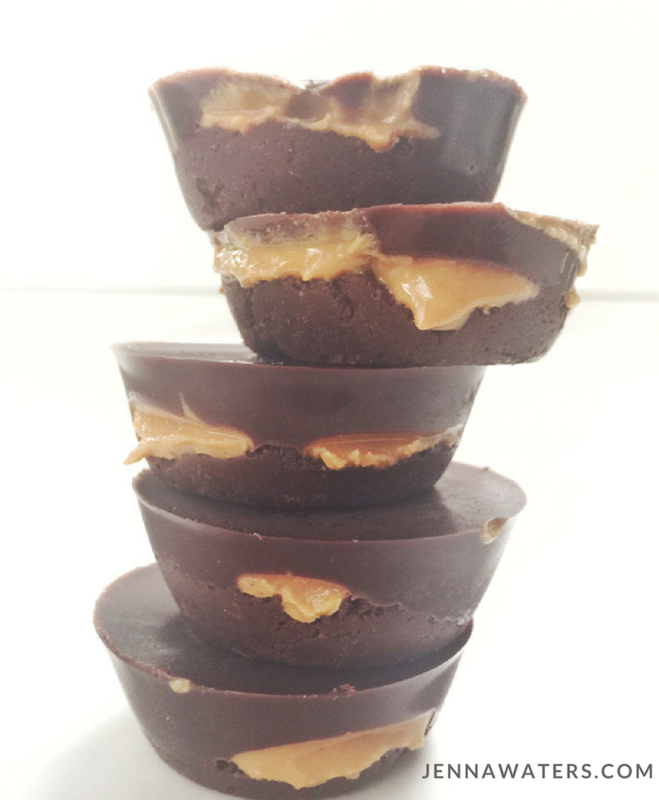 They help the PB Cups pop out easily and minimize cleanup time! Also, make sure your silicon mold is on a baking sheet, to avoid a mess all over your freezer. 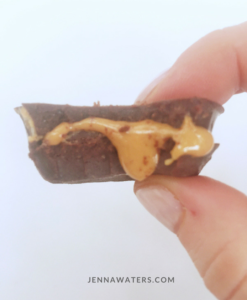 The peanut butter doesn’t have to spread all the way to the edges, so no need to be super picky! 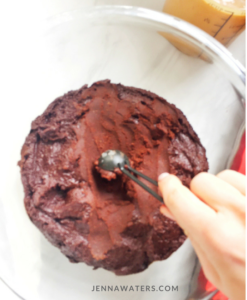 Then the fudgy topping….. Freeze for about 20 minutes….then [cue drooling]. I suggest storing these in the freezer, otherwise they will get too soft. Plus, they’re still soft and chewy right out of the freezer!
) 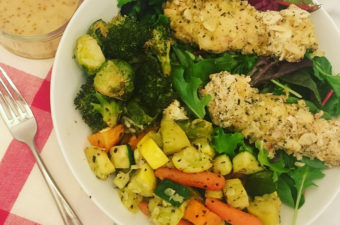 Combine all ingredients for the base layer in a bowl an mix until well combined. 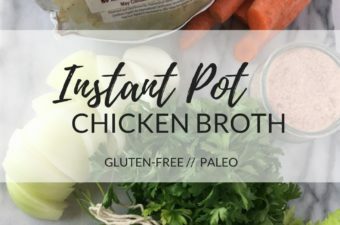 Refrigerate until it solidifies but is still able to be scooped with a spoon--about 15 minutes.
) Meanwhile, prepare the other two layers. 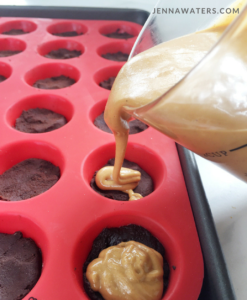 In a seperate container, melt the peanut butter and stir until in reaches a pourable consistency. 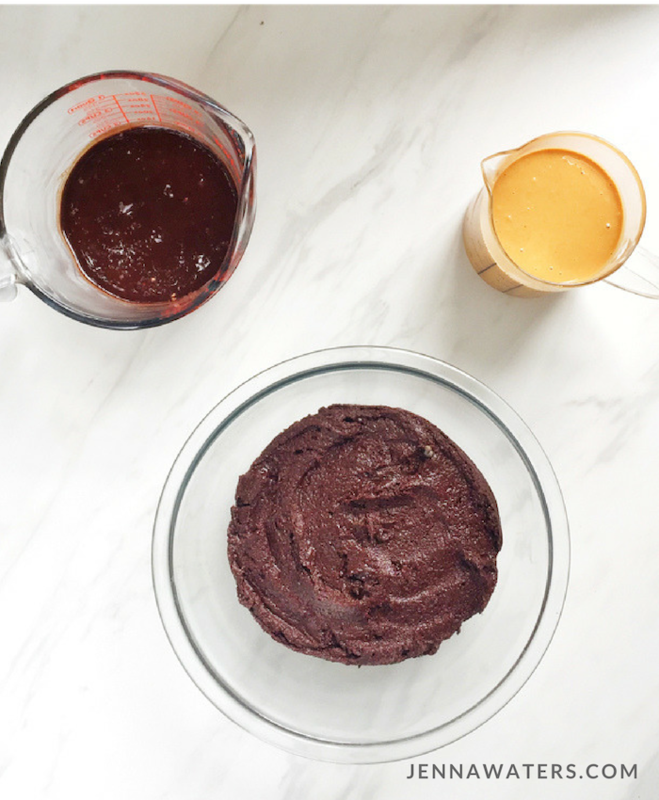 In a different bowl, melt the coconut oil and add cocoa powder and maple syrup for the fudge topping and mix until it is a liquid consistency and well combined.
) 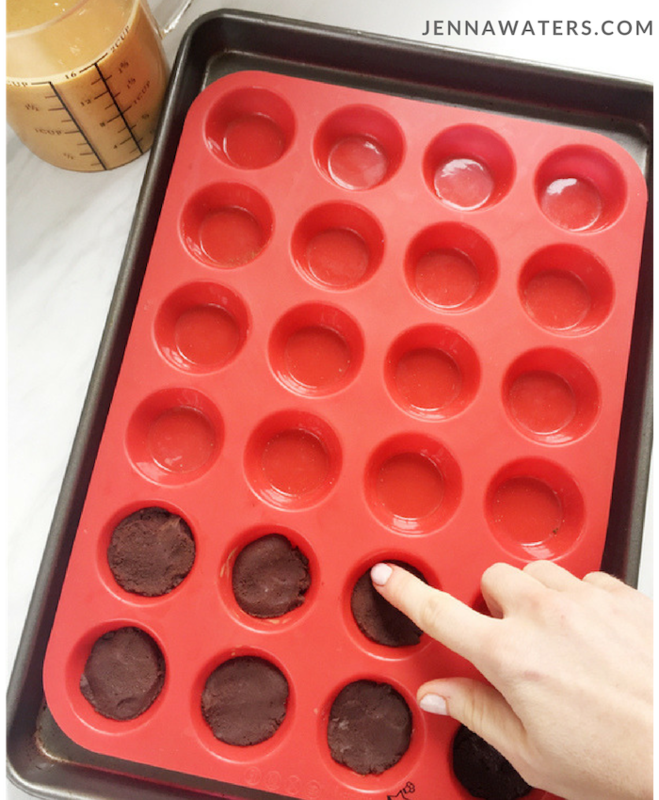 Place the mini silicon molds on a baking sheet and spoon 1 tsp of the base layer into silicone molds, filling about ⅓ of each cup. Push down with your finger to spread out and flatten.
) 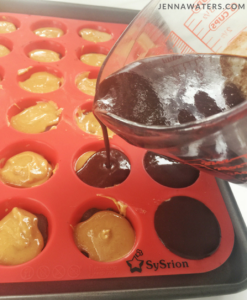 Pour peanut butter over the base layer of each cup, filling until about ⅔ full.
) 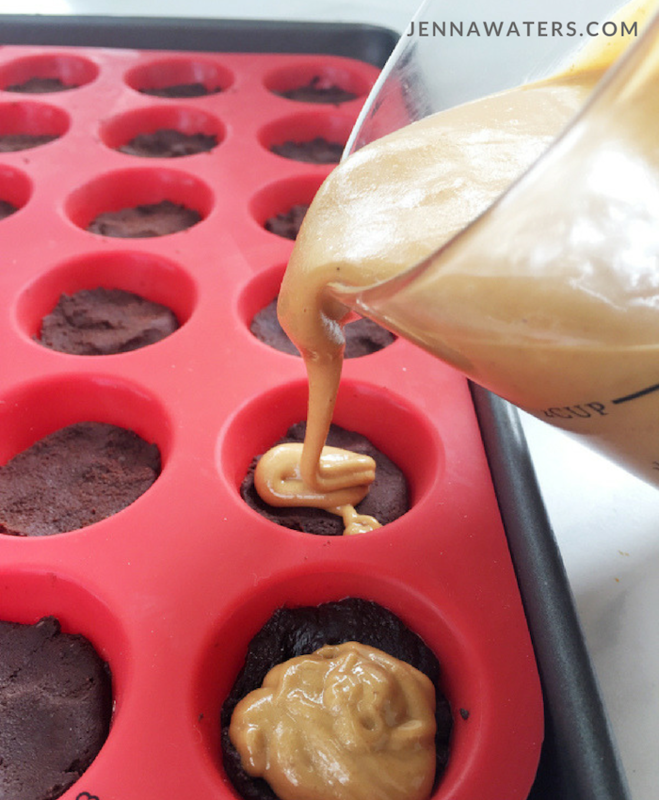 Lastly, drizzle the fudge over the PB layer of each cup, filling it to the top.
) Top each with a light sprinkle of sea salt (optional), and freeze until cups are frozen throughout and can easily be removed from the silicon molds (about 1 hour).